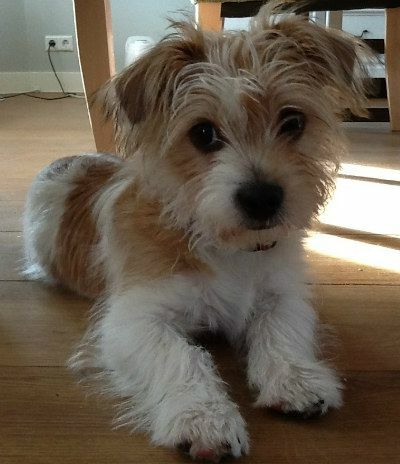 The Jack Tzu is a mix between the Jack Russell Terrier and the Shih Tzu. He is a tiny dog that tends to take after the body type of its Jack Russell Terrier parent, but with longer fur and smaller body. This hybrid breed may be slightly sensitive when it comes to things like training and discipline, but he does wonderfully when left alone for short periods of time. The Jack Tzu is an excellent choice for a family dog as he gets along well with virtually everyone, from small children to other pets and strangers. This is a very active dog who, although small enough to work well in any size home, needs a lot of chances to get out and exercise. The Jack Tzu is prone to being overweight if left alone for too long, so exercise is truly a must. 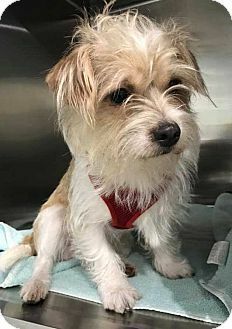 Overall, if you are looking for a small dog with lots of personalities who will make a wonderfully well-rounded family pet, the Jack Tzu is perfect for you. Just remember that they can be very hard to train because of their stubborn streak. If you are new to dog ownership, be ready for a challenge. The Jack Tzu is a kind of a dog that loves to eat a lot. What Price are Jack Tzu Puppies? A Jack Tzu puppy could cost anywhere between $300 to $750. How to Find Reputable Jack Tzu Breeders? The health of your Jack Tzu will depend on how they were born and raised by their breeders. This is why it’s important to find a reputable and responsible breeder. When you find a breeder online or through referral, it’s important to speak to them and ask all your questions about the Jack Tzu puppy that you want to get. Arrange a time for you to visit to meet their puppies, along with the puppy’s parents. They should also be happy to give you more than one meeting with the puppies to make sure that you are compatible. A reputable breeder is happy to answer all your questions and ask you just as many to make sure that their puppies are going to a good home. They should also be able to provide authentic paperwork and certificates for puppy vaccinations, microchipping, deworming, and results for health tests. A reputable breeder will not rush you into parting with your cash in exchange for a puppy. Remember that if anything seems suspicious, it just means that it is. Jack Tzus love to eat so make sure food is not available all day because they will overeat. They do not bark much, but if there are other dogs around, they will pick it up from them. They are always alert and make a good watchdog. The Jack Tzu is a small dog that weighs 14 to 23 pounds and stands 10 to 11 inches. He has long legs like the Jack Russell, with a long face and muzzle as well. He is usually smaller than the Jack Russell but with a strong body. His ears tend to flap over, and he can come with a beard and mustache. His neck is thick and his medium-length tail curls. The Jack Tzu’s coat can be like either parent, long soft, and silky, or short to medium and a mix of rough and smooth. Colors common to Jack Tzusare light brown, cream, golden, white, brown, and black. While the Jack Tzu is not high maintenance when it comes to keeping his fur beautiful and healthy, he does tend to shed a lot. Regular brushing at least 3 times a week with a bristles brush and a comb should be enough to keep the shedding controlled. Bathing is only needed when he gets really dirty or every few months because this breed does not have a bad doggy odor. After bathing your Jack Tzu, always be sure to dry his ears thoroughly. He has folded over ears that can trap excess moisture very easily which can lead to ear infections and irritation. You should also trim their nails every few weeks to maintain healthy paws and reduce scratching when he jumps up onto something or someone. The Jack Tzu gets on well with children and other dogs. 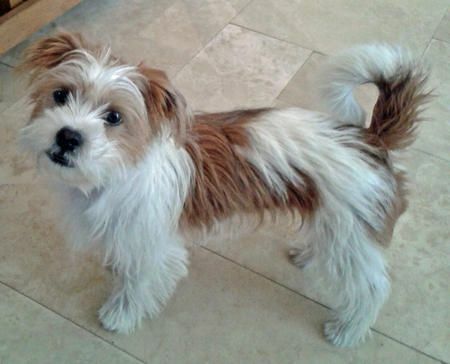 How Big is a Full-Grown Jack Tzu Mix? Male and female Jack Tzu dogs can grow to 10 to 11 inches and weigh anywhere between 14 to 23 lbs. What is the Life Expectancy of the Jack Tzu? The life expectancy of the Jack Tzu is 12 to 15 years. The Jack Tzu is a smart dog who loves to play and be active. He also likes being laidback and happy with their humans. He is very loyal, friendly, and affectionate. He also loves to lick and dig. The Jack Tzu does have a stubborn side and can get up to some crazy antics. He is not overly yappy like some small dogs and enjoys lap time with their humans. He is very lovable and adores being the center of attention. He is very alert and likely to follow their humans around. With his independent side can come a certain arrogance, which means he needs watching over when he’s around larger dogs because he may try to challenge them. A typical Jack Tzu will have no problem letting its owners know its feelings. These dogs are happy and loyal, but they can have minds of their own and will not obey their humans unless taught to do so. Training a Jack Tzu won’t be easy. These dogs are known for being hard-headed and might refuse to obey rules or commands. Begin their training while they’re still a puppy and use a firm, positive, and rewards-based methods. Despite their stubbornness, Jack Tzus are loyal and protective and make good watchdogs. While not overly yappy, these dogs are very alert and will bark if confronted with an unknown sight or sound. The Jack Tzus are happy and loyal dogs. The primary ingredients in your Jack Tzu’s diet should be meat-based proteins, such as poultry, beef, or fish. Avoid foods with grains such as wheat or corn. Lower quality ingredients such as meat by-products are harder to digest protein sources and should be a minor component of their dog food. Wet food is often more appealing to them. However, it is not beneficial for the teeth like dry food is. It’s also more expensive, and a diet of mainly wet commercial food can cause runny stools. Dry food is good for a dog’s teeth and is generally easier on the stomach, which leads to healthier stools. Considering all these elements, a diet of dry kibble is best. If your Jack Tzu likes to eat wet food, you can drizzle dry kibble with a little bit of low-sodium chicken broth and warm it up. How Much Exercise Does a Jack Tzu Need? This dog loves to play. He will chase and fetch a ball for ages. He is agile and loves to walk and run. Take him to a fenced in area so he can enjoy time off leash. He has a lot of stamina and can last quite a while burning off some of that energy. He can adapt to living in an apartment, but he is very active and it would be great for him to have access to a yard. Aside from meeting his physical needs to ensure he is well-behaved and healthy, he should also be given some mental challenge. He can be very stubborn sometimes which can slow things down when it comes to training. Early training and socialization should not be skipped for any dog. He will be a lot better and confident for it. Make sure that you are clear about being the boss, and that goes for other people in the house, too. Otherwise, he will try to boss everyone. Be patient, positive, and firm. Reward him with treats, praise, and encouragement. No matter what you choose to do, always make sure that you spend time on training. This will not only tire your dog out mentally but also teach him how to behave in different situations. Because the Jack Tzu is small and doesn’t bark much, he can live virtually anywhere as long as he has a place for exercise. The parental health issues that a Jack Tzu could inherit include patellar luxation, kidney and bladder problems, eye problems, umbilical hernia, liver problems. Legg-Calve-Perthes, deafness, allergies, hip dysplasia, ear infections, dental problems, snuffles and reverse sneezing can also be a concern. To avoid these health risks in your dog, you should see the health clearances for the parent dogs and visit the dogs at the breeders to assess their conditions. In general, the Jack Tzu gets on well with children and other dogs but needs some help and early socialization especially with other pets. Otherwise, he tends to chase after them like prey. He is good with children of all ages, but children should be taught how to touch and play with them so that they do not hurt them.